And then, suddenly, he caught his breath, looking into a [railway] carriage. This girl was different. Black hair, rich creamy pallor — eyes with the depth and darkness of night in them. The sad proud eyes of the South… It was all wrong that this girl should be sitting in this train among these dull, drab-looking people — all wrong that she should be going into the dreary midlands of England. She should have been on a balcony, a rose between her lips, a piece of black lace draping her proud head, and there should have been dust and heat and the smell of blood — the smell of the bull-ring — in the air. She should be somewhere splendid, not squeezed into the corner of a third-class carriage. What the hell was she doing in this country of fogs and chills and hurrying industrious ants? observations: This passage is listed on a website called Thought Catalog* as one of Agatha Christie’s top 10 racist moments, so we bring it to you proudly. (Really, THIS is your best shot? Dude, you’re not trying). The cover of a recent paperback shows a grinning skull wearing a Santa hat. It’s a very well-done picture but it is wholly inappropriate for the book - as we pointed out with Christie’s Halloween Party, she gives us the occasion, a bit of seasonal description, then we bring our own thoughts to the setup, while she gets on with planting clues and trailing red herrings. Fictional murder at Christmas is usually about the awful destruction of a family atmosphere – in this case you think the party wouldn’t have been much better without the murder. It’s great stuff though, one of her very best, with a victim you don’t much care about, some of those weird long-married couples AC likes dissecting, and young Pilar, above, being very Spanish. A ‘coat and skirt’ isn’t what it sounds like – it is what we would call a suit. It was also sometimes called ‘a costume’ back in the day. We said, talking about PG Wodehouse last week, that only Christie could match him for percentage of impostors in a plot, and HPC would be Exhibit A in that field. Links up with: Agatha Christie has featured many times – click on the label below – and there are Xmas entries all last week and next. 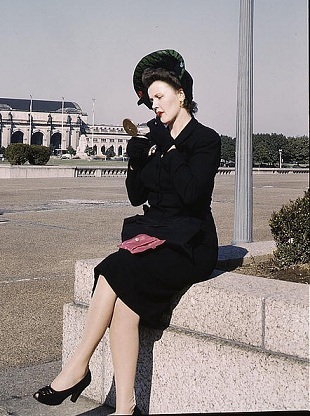 The picture – don’t you just want to stare and stare – was taken outside an American railway station in 1940. *No link. This is deliberate. When I looked at some of their other items, the Christie/racism list was one of the better ones. ‘Supporting the future of journalism’ it says on the site. We’re all doomed then. It is one of her best ones isn't it? And stands up very well to re-reading. Bernadette, I think you are just more honest than most people!